Downtown Wichita has nine hotels and is a hub for bars and restaurants. Combine that with its walkability, and you’ve found one of the top gathering spots in Wichita for watching sporting events with fellow sports fanatics. We’ve put together a list of sports bars and bar and grills with plenty of TVs that are within walking distance of INTRUST Bank Arena, site of the first and second rounds of the 2018 NCAA Men&apos;s Basketball Championship on March 15 & 17. 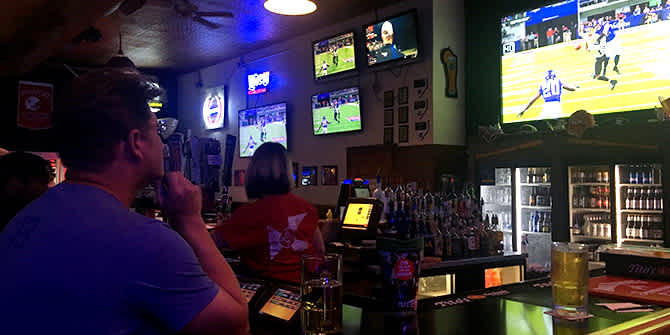 These are the spots you’ll find locals and visitors watching college football and NFL games this fall or Wichita State University basketball games throughout the winter. They’ll be the go-to spots for college basketball fans without tickets to the big games at the arena or those wanting to catch games from around the country while they wait for their team to tip-off in Wichita. Emerson Biggins has 35 HD TVs and three projectors on 100-inch screens. They also have an expansive menu featuring burgers, sandwiches, soups, salads, pizza, Mexican dishes and more, along with daily food and drink specials. Heroes opened in 1991 when the Old Town district was founded, making it “Old Town’s Original Sports Bar & Grill.” With 28 TVs and two projection screens, fans can watch the game sitting at the bar, in a booth or at a table on the heated outdoor patio. The menu is packed with classic bar and grill fare. Downtown Wichita’s only brewpub, River City Brewing Co. has 16 of its handcrafted beers on tap! The brewery opened in 1993 and offers a classic brewpub menu. Come for the collection of “Not Your Mama’s” mac and cheese or various pizza options, or to try one of their microbrews while watching the games on 15 screens, then stay for live music in The Loft at River City Brewery every weekend. You’ll want to check out the oil change pit and lift that are still visible from this building’s days as a filling and service station, and weather-willing they’ll roll up the garage doors that lead to one of the biggest patios in Wichita. Known for its burgers and pizzas, Pumphouse has 36 TVs, including six outside on the patio and nine projection screens. Along with a full menu starring pizza and 110 beers from around the world, Old Chicago’s Old Town location offers 20 large HD televisions and a festive vibe. For the answers to all your NCAA Tournament questions, click here.